Love is in the air... so who loves the BROWN? Who loves history? Who loves ships? Museums? How about being 'attacked' from the air by the Japanese? In the spirit of Valentines Day, we've compiled some fun images and stories below. 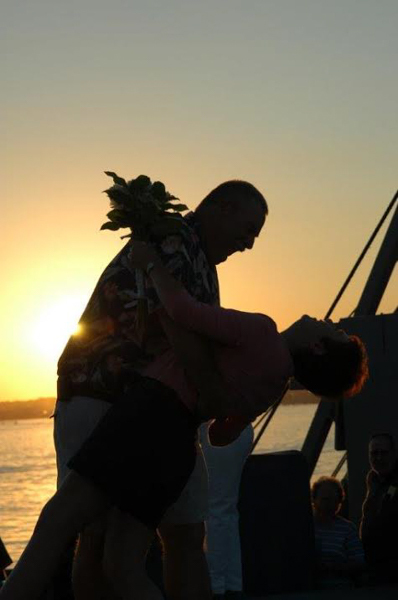 Also, if you're interested in getting your special someone a unique gift...an adventure... a one of a kind experience, click the links at the end of the blog for a special Valentines Week cruise ticket promotion; offer active from 11 Feb to 16 Feb.
Love stories may not be the first thing you think of when you hear "WWII Liberty Ship," but stories of love are easy to find. The ship has even provided a unique venue for many weddings over the years! In our Navy Armed Guard quarters, you will find a copy of a letter that no sailor wants to get. In the summer of 1943, Walter received a "Dear John" letter from Marge. She told him of a nice young man with a blue convertible who takes her dancing. We have this letter because Walter was on one of our Living History cruises in the late 1990's with his daughter. She is the one who rewrote the letter for him. His copy was falling to pieces from carrying it in his wallet for years. We found out that he did find himself a wonderful girl and they had two children and many happy years together. We know that Walter did see Marge again many years later. He visited her in the hospital before she passed away. We don't know what they talked about that day but would like to think it was a conversation filled with sharing good life stories. If this reaches the family of Walter or Marge, we'd LOVE to hear more of their story. Remember, we are always willing to preserve artifacts or pictures (books, flags and even Dear John letters) from this time period. Crew Members Joey and Craig are one of the many couples who were married on the ship. Passengers had just disembarked after our 60th Anniversary/Birthday Living History Cruise and Craig and Joey were married on #2 Hatch by the ship's chaplain (Rev. Ray Reno), just North of the Key Bridge. Joey and Craig (a nurse and paramedic, respectively) are part of the ship's medical team (Craig since 1997 and Joey since 2001). Baltimore City's Fire boat, the Thomas D. Alesandro Jr, saluted the couple at the end of the ceremony. There are also many families and couples who volunteer together on the BROWN! Brian and Patty get into the spirit of things while the Manhattan Dolls are performing. From Left to Right: RADM Richard A Bauman, Liam Bauman, and Captain Rick Bauman Jr. during the Great Lakes 2000 trip. 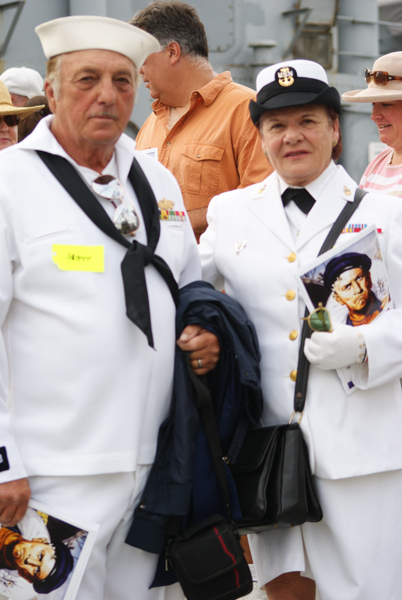 Ship's Bosun, Walter and his wife Judy, "Mrs. Bosun," volunteer most Wednesdays and Saturdays. Here they take a moment to tease one of the ship's photographers. 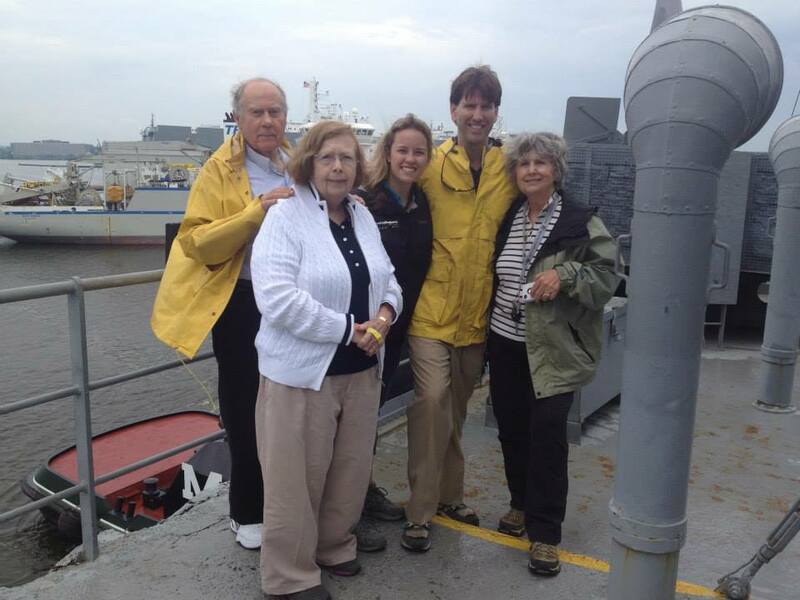 Ben and Kathryn, seen with family (above), were married by Captain Rick in 2014. Volunteer mother and son, Andrew and Sue take time out from work on one of the cruises to show some affection. Crew member David with his grandson Holden on one of the 2013 cruises. Holden is wearing his grandfathers uniform from the war. But, besides the crew, many people enjoy spending the day with loved ones, while on a day-cruise of the Chesapeake Bay, on a WWII Liberty Ship. Some show up, not knowing what to expect, while others come back each year or so. Some (see the picture towards the bottom of the blog) even theme dress while others will just break out in dance, along with our entertainers. 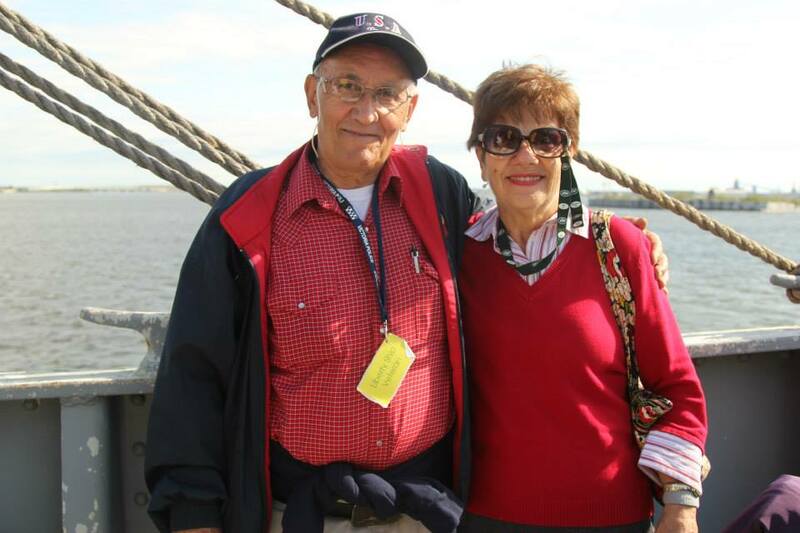 Here we have Tom, a Liberty Ship veteran and graduate of the JWB (class of '51), with his wife Marie, enjoying a day at sea on the October 14th Living History Cruise. Below: More pictures of happy couples on the BROWN. So don't treat your sweetheart the way Marge treated Walter; give them an experience they'll remember forever, but in a good way. 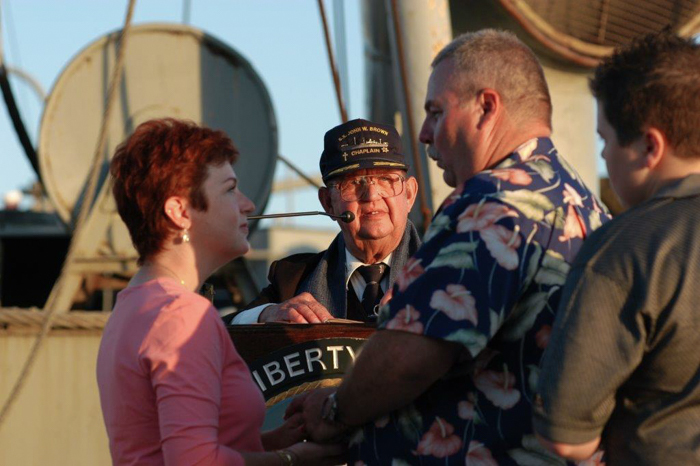 Your love may not carry around their 'Dear John' letter, but they will have unique memories aboard a WWII Liberty ship. To buy tickets for the May 9th cruise click HERE. Enter the promo code: lovethebrown for discounted tickets! To buy tickets for the June 13th cruise click HERE. Enter the promo code: lovethebrown for discounted tickets!